First, let's bring understanding to the taxonomy as outlined by Benjamin Bloom. The hierarchy of skills is divided into LOTS - lower order thinking skills such as remembering, understanding and applying, and HOTS - higher order thinking skills - such as analyzing, evaluating and creating. Using a balanced approach to include all these thinking strategies into your lessons and digital applications will benefit student learning. The most impact to student learning comes from a variety of higher order applications. We will go deeper into the skills relevant to thinking and learning by investigating the work of Benjamin Bloom and the taxonomy of learning. The revised taxonomy and digital applications of the taxonomy can be found on this media rich site created by Andrew Churches. Andrew Churches created a comparison from Bloom's Taxonomy to the 'three story intellect' that requires a closer examination. The application of Bloom's taxonomy to the integration of digital technologies into the classroom is essential. Taking a balanced approach to where, when and why students are using, creating and sharing digital content is necessary. Teachers need to carefully plan for short term and long term projects, inquiries and tasks with consideration of available digital tools and resources, student readiness and scaffolding learning to achieve success for all. 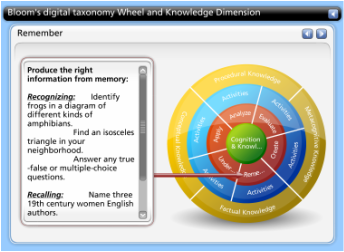 Take a moment to explore this taxonomy wheel to gain some insight into where and when Blooms taxonomy applies to teaching and learning with digital technologies. 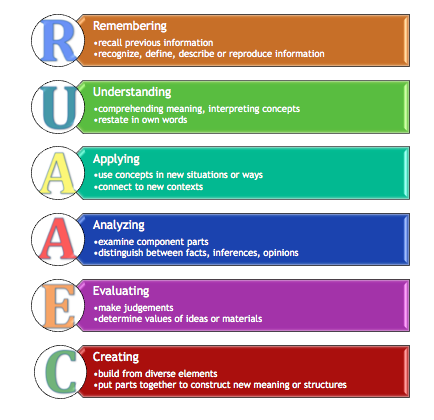 Blooms Taxonomy has been investigated in a variety of ways by various people. Andrew Churches provides a comprehensive document that examines the application of Bloom's taxonomy to digital technologies HERE. Further exploration and resources are available on Churches' wiki site HERE. A collection of images for digital technologies linked to Bloom's taxonomy is available HERE. Kathy Shrock has collected, created and curated a COLLECTION of BLOOM's related graphics and resources. For some classroom applications of Bloom's Taxonomy, view the items on this Pinterest collection where Bloom's Taxonomy is applied in a variety of contexts and for a variety of purposes. Blooms Taxonomy - LIST of verbs to use when applying the taxonomy to student work.